Part two of Ryan Leach’s Steve McCabe interview. Photos courtesy of Stu Kawowski. Ryan: The Axemen’s membership was always fluctuating. Steve: We had a good range of Christchurch and Dunedin musicians in the band. If you’ve seen our Wikipedia page, you can see all the people who’ve been in or performed with the band. Ryan: On Three Virgins there’s a recording of you talking with an American about Beverly Hills and Mardi Gras. Do you recall who you were talking with? Steve: No. I don’t remember. Ryan: There’s also another conversation on Derry Legend (1987) where you’re being interviewed but replying with unrelated answers—about how the New Zealand dollar is weak. It’s pretty funny. Steve: We had a lot of abstract ideas. It had to do with stream-of-consciousness. Three Virgins is a good example of that mindset. Everything just sort of flowed out without any hesitation. Ryan: What kind of reaction did The Axemen get from people in the middle ’80s? I imagine your sound was a hard sell to some people. Steve: The variety of genres was probably a good thing. We had a lot of jokes in our songs. If people could understand the lyrics and pickup on the jokes, I reckon that was a good thing as well; people like jokes. We didn’t take ourselves too seriously. Ryan: The Axemen recorded just about everything they did. Steve: Yeah. I still have all of the cassettes. There are about three hundred of them. Ryan: Unbelievable! Are these tapes mostly of live shows or home recordings? Steve: A bit of both. I always preferred recording to playing live. I got a four-track recorder in 1986. We did a lot of recordings on that. 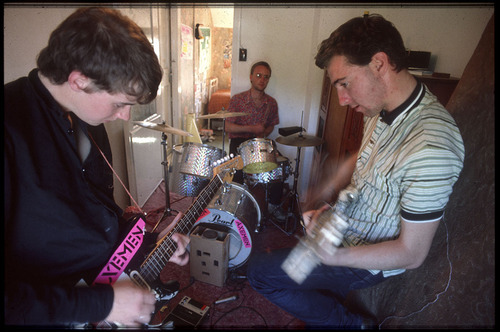 We used to record our practices and do overdubs on them later. We released a lot of cassette tapes that didn’t show up on Flying Nun. They’re not available at the moment. We used to screen print covers for them. Ryan: What was The Axemen’s relationship with Flying Nun like? I imagine the financial loss of Three Virgins might have caused a bit of strain. Steve: Flying Nun did eventually sell all of the pressings of Three Virgins and Derry Legend. It did take them a while to sell them though. Tom Lax just rereleased Three Virgins on Siltbreeze. He was pleased with it and did two more of our records. I don’t know if Flying Nun lost interest or what but there was a demand for those albums. Ryan: They haven’t done a great job rereleasing their back catalog. If you want a vinyl pressing of (The Clean’s) Boodle, Boodle, Boodle you’d better have ninety bucks on hand. Steve: They haven’t. I’ve seen original copies of Three Virgins go for good money too. Ryan: Derry Legend hasn’t been rereleased yet. That record goes for fifty bucks. Steve: Yeah. Derry Legend is being rereleased soon. Dustin Travis White, who did live sound for us on The Axemen and Times New Viking tour, is going to rerelease it on his new label, Luxury Products. Stu remastered it all on analog for the reissue. It’ll come out after Sac Tap Nut Jam. 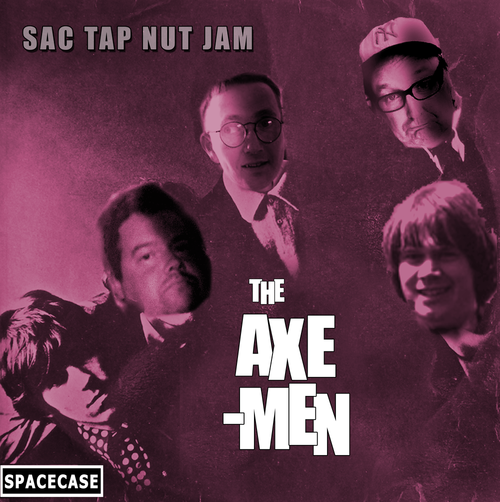 Sac Tap Nut Jam is completely digital. Hearing those two records back to back will be interesting. Ryan: You released your solo LP Sweat It Out (1986) around the time of Derry Legend. Steve: I released a whole lot of solo cassette stuff too. The EMI record pressing plant in New Zealand closed down around that time. It was the only plant in New Zealand. I did release one single after Sweat It Out. Then I did about four or five cassettes on Sleek Bott. Ryan: Did it become cost prohibitive to release records after the New Zealand EMI plant closed down? Steve: It did. New Zealand record companies would go through Mushroom (large Australian independent label). It became more difficult for them to press up records. For individuals it really became too difficult. Ryan: One of my favorite Axemen records is Scary Part III which Tom (Lax) at Siltbreeze reissued recently. Did Flying Nun not want to take you up on that record when you originally recorded it? Steve: I think it had to do with Flying Nun being sold to Mushroom. It messed up our relationship with the label. Mushroom was more interested in getting Flying Nun’s back catalog than releasing new stuff. Ryan: That’s right. With some exceptions—like King Loser—quality control at Flying Nun started going downhill after they partnered with Mushroom. Steve: Yeah. Things started getting a bit poppy. Ryan: Scary is the record where The Axemen got really into sampling. Steve: That’s true. Although there’s a tiny bit on Derry Legend. Stu and I had these SK-1 samplers. They’re a Casio sampler. It had a little microphone on it and you could create one-and-a-half second loops of samples. Ryan: What motivated The Axemen to do an Elton John tribute record (1992’s Three Rooms)? Steve: It seemed like a good idea at the time. There’s a good range of songs in Elton John’s catalog. Good chords and things. Ryan: The Axemen sort of wound down after the Elton John record, correct? Steve: No. Stu and Bob moved to Auckland in about ‘87. I was playing in Christchurch from 1987 to 1990. Bob had formed the band Shaft. My wife and I got married in Las Vegas in 1990. We toured around America for our honeymoon. When we came back to New Zealand we moved to Auckland in 1992. Bob, Stu and I were all in the same town again so we did those two records on Sleek Bott—Recliner Rocker and Dirty Den Sessions. After that we didn’t do anything together for a while. Bob was busy with Shaft and I started a screen printing business with my wife. I started a band called CFCs in 1995. We played with Shaft for a little while. I released a solo CD called Generations (1998). Steve: I like it too. I can’t get any copies of it. The guy who released it has heaps of them—about four hundred of the five hundred pressed. They’re sitting in his garage somewhere. I try to get them off of him. He keeps saying he’ll get them for me but it never happens. It’s really annoying. People are interested in it. Ryan: A number of your songs have a lounge feel to them—going back to “Effectively My Baby” on Three Virgins. That aspect of your songwriting comes to the forefront on Generations. Steve: Yeah. It was great being able to do those arrangements on the computer—get the big orchestration. I always wanted to do what Frank Sinatra and Nelson Riddle did with big orchestras. I was really pleased with it. Ryan: Over the last four years there has been a resurgence with The Axemen. Obviously that has a lot to do with Tom Lax reissuing a number of your records on Siltbreeze. How did you guys come in contact with Tom? Steve: When I moved up to Auckland, Tom sought me out. He bought everything I had—all the old Sleek Bott cassettes. That was in about 1992. I didn’t hear from Tom for quite a while after that. E-mail wasn’t around. Tom did a couple of reviews of our albums. Later on he bought the remaining copies I had of Sweat It Out. He sold all of those. That was more recently. 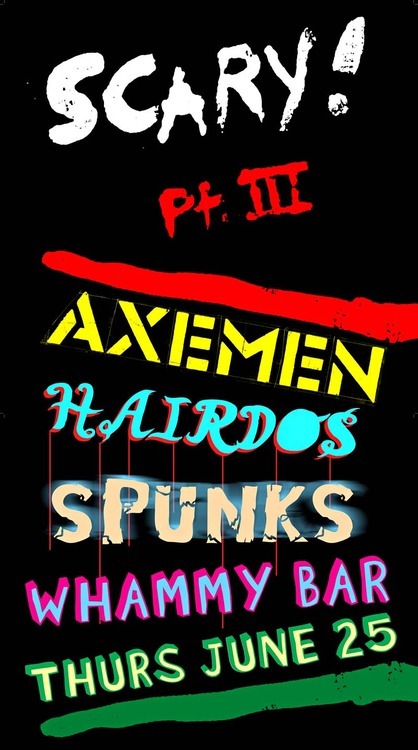 The Axemen had been on hiatus for a while. When Tom decided to rerelease Cheap Motel, Three Virgins and Scary, we talked with him about doing a US tour. He lined us up with Times New Viking; we did the US tour with them in 2009. Tom came to quite a few of the gigs. Tom apparently was always playing Three Virgins to people, long before he reissued it. They’d ask him if it was available; eventually he decided to put it out. Ryan: You did a tour of Australia a couple of years later. You hooked up with Brendon Annesley and did a great single with Negative Guest List. Steve: That was cool. Brendon died shortly after that. He was a talented guy. A good writer. Ryan: Bob Brannigan is no longer in the band. Steve: On the last tour he was partying too much. It sort of got on my nerves. We had a bit of fight and he decided he didn’t want to play with us anymore. Ryan: You’ve got the young gun in the band now. Ryan: William Daymond. He’s younger than me. Steve: Oh, yeah. He’s not a replacement for Bob or anything. William is a songwriter—although we haven’t written any songs with him yet—but it’s good having someone else in the band who can contribute songs. He seems to be fitting in well. Ryan: We (Spacecase Records) wrote you about doing a single. But you had so many good tracks we asked you for a record instead (Sac Tap Nut Jam). Steve: Yeah. We were keen on the single but doing a full length was so much nicer. I just bought a sixteen-track digital recorder. It’s about the size of a laptop. Dragan has a whole lot of mics. When you came up with your offer we all decided to go down to Wellington; Dragan has a practice space there with a lot of nice mics and William lives there too. We decided to record a number of songs and pick the best two for a single. We ended up with so many extra tracks doing an album came naturally. I was really pleased with the results. I really like the sixteen track recorder. Ryan: I was surprised by how high the fidelity is. Steve: Dragan is a really good audio guy. Ryan: Is this the first vinyl record you’ve released of new material since Derry Legend? Steve: Yeah. Not counting the reissues. Ryan: Is there any chance Sweat It Out is going to be reissued? Steve: There’s a possibility but not on LP. It might be reissued through Dusty who’s doing the Derry Legend reissue.